Open late May-Oct, see schedule. Travel through a natural woodsy setting along the twisting "Pemi" River, just a few minutes away from Franconia Notch. You can relax, wave to the swimmers, kayakers & tubers. Best Ride for Kids by New Hampshire Magazine. 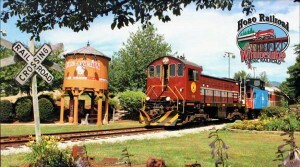 Not just a train ride, it's a family fun attraction with scheduled entertainment, picnic facilities as well as the "Hobo Jungle" Playground. Meet Hobo Buddy the clown every Monday to Friday this summer! He will entertain families with his balloon and magic acts onboard the regularly scheduled trains as well as put on a show in the Choo Choo Theatre at the Hobo Jet Station in Lincoln, NH. Meet storybook characters every Sunday this summer! Well-known storybook characters, reading and greeting at 12:30 and 2:30. See HoboRR.com/hobo.html for schedule.